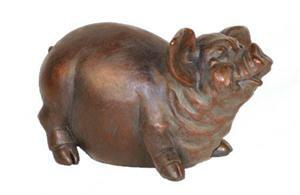 For those who love the look of the pig, here's one cute little fella who will make your heads turn. He comes adorably crafted from resin and makes a perfect addition for the desk or as a gift for someone who loves all things piggy. Resin. also suitable for outdoor use. Dimensions: 8" x 12" x 8"
According to Native American culture, the pig is a very powerful totem and is associated with prosperity, spiritual strength, fearlessness and balanced complacency. It is also considered a harbinger of rain and linked to abundance, fertility and agriculture. It is also said that native American culture provides that each person is connected with 9 different animals that will accompany him or her through the journey of life. These animals will act as guides and will appear depending on the direction of life we take to guide us. The pig is credited as being one of those guides.